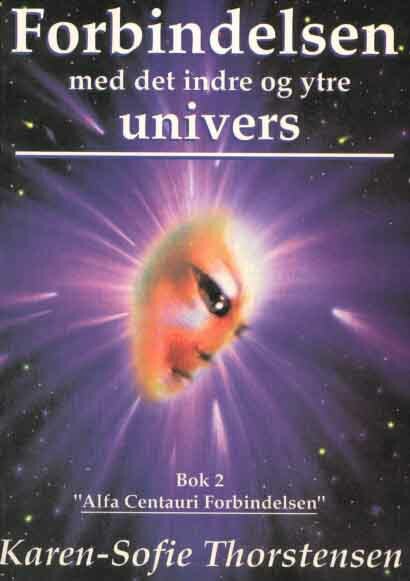 Out of another dive into the library of ufo-researcher OJBrenne in Norway, I have done another book report. This one from the intr.ufo-book from DrVigilo Sanshez-Ocejo, which Col.Wendelle Stevens later got translated from Spanish into English, and published in 1982.
picture down right here are manipulated from the books black-white pict.of Rune, this up is of jim -james - nichols. This contact-book is about the experiences of an out-moved Cuban - Filiberto Cardenas who in jan79 lived in Florida, where he had had a gift shop; "Zarabanda", at 4150 East 4th Avenue, Hialeah. He sold that and bought out a small filling station and automobile service shop called Barbara Service Center, Inc., at 4105 East 4th Avenue, which was then no big money maker. He developed the service station business into a highly successful operation, but it took all of his time, and most of his wife's, all days of the week and Saturdays and Sundays. He needed more time to conduct his own investigation into what was happening to him and to tell others who would listen to what was going on. He sold the business on his birthday, the 31st of October, and began to make plans to visit UFO conferences and investigators around the country to see how much was happening to others. That is the day DrVigilo Sanshez-Ocejo tells he met him for the first time. Filiberto's experiences actually began on 3 January 1979, and investigation of the case was most ably undertaken by Dr. Virgiho Sanchez-Ocejo, Jr., an Attorney and local UFO investigator and researcher who was working diligently on a number of substantial UFO cases already. Sanchez entered the case on 4 January, the day after the first abduction, while Cardenas was still in the clinic, and began the long and highly detailed debriefing. He developed details and tested the data. He arranged for medical and psychological, and even neurological examinations of the witness and provided a hypnotherapist and expert on the subject to conduct regressions of the witness back to the actual contacts to develop details. The witness was found to be perfectly normal in every respect, except for the body marks, skin abrasions, and systemic disfunctions resulting directly from the UFO contact. Sanchez was assisted by Mr. D'Agustino, an electronic Engineer, for many years a UFO investigator and MUFON representative in his country Uruguay, South America. Mr. D'Agustino is now living in Miami. On the 3rd of January 79, at about six PM, a Thursday evening, Filiberto Cardenas, then 46 years old, was snatched by a buzzing object that emitted a beam of violet-bluish-white light which caused him to float up the beam and out of sight of his three friends with him. He seemed to go into a darkish bag-shaped (later described as roughly football-shaped) object which then flew away to the west with Cardenas aboard. Filiberto and three members of the Marti family, Fernando 46, his wife Elizabeth 36, and daughter Mirta 13, of 8632 NW 35th Court, were just before this happening returning from an unsuccessful effort to buy a suckling pig for a Sunday-night supper. The farmer they had gone to see had no more pigs for sale and they were returning to U.S. Highway Route 27, also known as Okeechobee Road, to go back home. 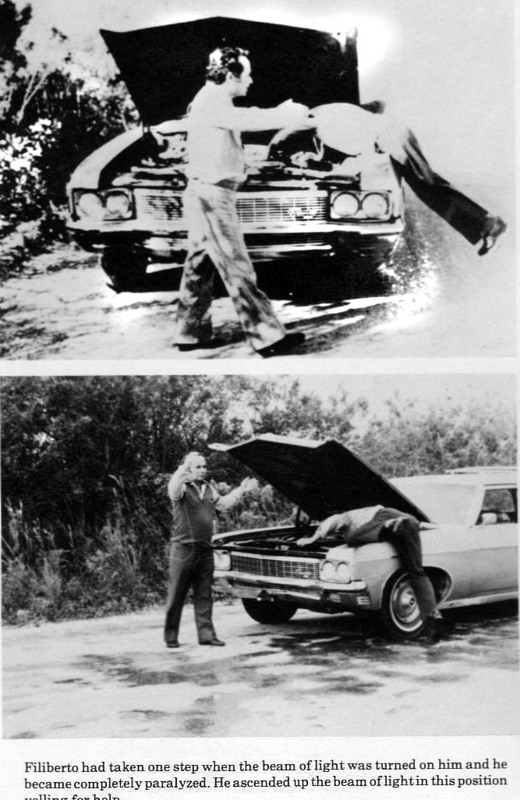 Cardenas' 1970 Chevrolet Station Wagon developed electrical problems. The headlights and all other lights went out and the engine stalled, and the car came to a stop near Florida's Turnpike Extension. When Fernando tried the starter there was no electrical current al all. Fernando, who was driving at the time, and Filiberto got out and opened the engine hood and looked in at the engine to see what was wrong, Cardenas said. "At that moment the engine began to reflect different colors, red, violet, blue, orange and then a bluish white." They heard an intense buzzing noise, "like many thousands of bees," Cardenas said. "I tried to move but I was paralized in position, unable to do anything-even unable to move my arms. I could hear the screams of the women in the car. I looked down and saw that I was suspended in the air and rising. When I was 8 to 10 feet above the car everything went dark, and I don't remember what happened. "The next thing I remember is waking up to consciousness on my hands and knees, and two bright lights rushing at me. I heard brakes screeching and tires skid, and the lights swerved and came to a stop. I was helped from the road by a man taking my collar and leading me off the road. 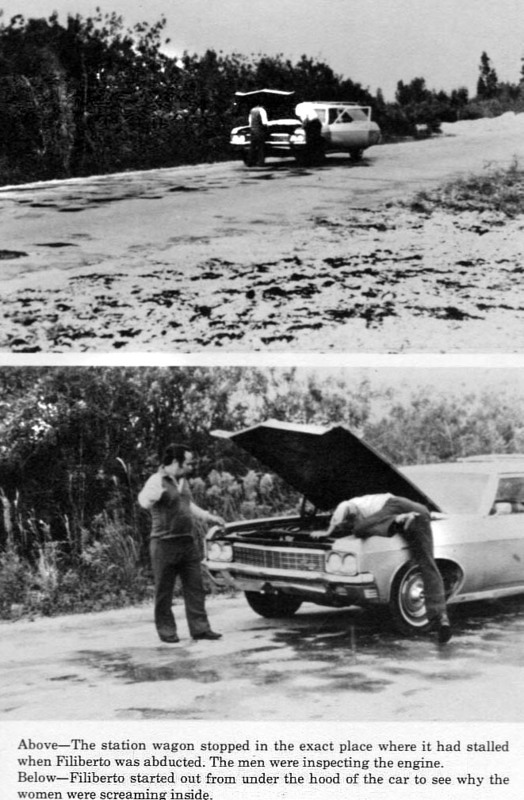 I learned later that this was near 137th Avenue on the Tamiami Trail, some 16 miles from where my car stalled." A motorist called Police and Patrolman William Christian of the Fifth Precinct Station came and picked Cardenas up. This was about 8:15 PM, two hours after he had been elevated up the beam of light before the eyes of his friends. The police officer later said that Cardenas told him he had no idea what had happened. When I (Stevens) interviewed Cardenas, he told me that he did not dare tell the policeman what he knew for fear of being considered crazy. Meanwhile, Fernando Marti, who was also looking under the hood with Cardenas, saw the engine reflecting the various light colors and then saw Cardenas' feet ascending above the hood, to his left. He also felt weightless and jumped further into the engine area, on top of the hot engine, and grabbed hold-which probably saved him from Cardenas' fate. When the light dimmed and he felt weight again he looked out and saw Cardenas rising and shouting, "Let me go, let me go!" He watched Cardenas float up the beam of light until he entered the dark bag-shaped form that then flew west. Fernando ran around the car to comfort the screaming, trembling women and told them, "They took Filiberto-they took Filiberto!" Fernando's wife Elizabeth had been in an earthquake in California, and fearing the same thing when the car started shaking had grabbed Mirta and pulled her across her lap, putting her arms around her for protection. Fernando jumped into the car and tried the ignition again and this time there was spark and the engine turned over and started, but ran very roughly-like it was not getting enough gas or something. The car chugged forward slowly and then began to improve a little, finally running all right again. Fernando stopped at the nearest facility and called the police to report the problem, but they told him to go to a pay phone and callback. He got back into the car, which started OK this time, and they drove to Hialeah to a pay phone. He called the police again and reported what had happened and Cardenas' disappearance. Then he called Cardenas' wife, Iris, and told her that an object with a large light had taken Filiberto. She wanted more details and he tried unsuccessfully to explain something he himself didn't understand. Mrs. Cardenas began to cry. When Fernando hung up the phone, Iris got a nephew to drive her to where Filiberto had disappeared, and after checking with the police and finding that they knew nothing more than Marti's call, she and the nephew set out to see what they could find out. They didn't find anything at the scene. When Cardenas was found about 8 PM, the police notified Mrs. Cardenas and she rushed to the station and took him to a local clinic for treatment. "I would find it hard to believe if I read about it in a newspaper," admitted Marti, "but I was there with my wife and daughter. We were all terrified by the light and the noise," he said. "When it ended Filiberto had vanished." 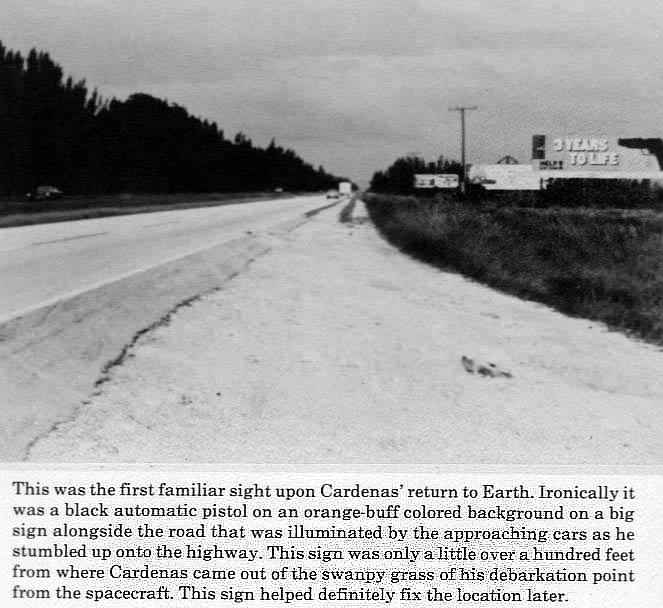 "Before this happened," Cardenas said, "I scoffed at UFOs. Now I know differently." Someone said that a checkup should be made for radiation if this was in fact UFO related. The local clinic was unable to treat or examine for such effects and Cardenas was taken to Miami's Jackson Memorial Hospital about 01:30 in the morning of the 4th to see what they could do. His medical records show that he complained of pains in both knees and out-of-focus vision in the last hour. Following X-rays and a general examination, the hospital noted, "Stable vital signs," a 0.2x0.2 centimeter abrasion on his forehead and a 2x2 centimeter yellow lesion on his right shoulder. He was also checked for radioactive contamination at the hospital by an Air Force team sent up from Homestead Air Force Base, south of Miami, The tests were negative and he was released and sent home. Cardenas developed various odd symptoms, i.e. excessive thirst, profuse sweating, sulphurous body odor, short memory, hot and cold flashes, and sexual dysfunction. His urine was a very dark yellow-brown and had a bad odor. Homestead reported no unusual air activity observed by RADAR during the time of this abduction. Dr. Jose Yedra, a local hypnotherapist who had no personal position on UFOs, pro or con, regressed Filiberto into the experience 4 times to develop details and help restore the lost memory. This had to be done in Spanish as Cardenas is not fluent in the English language. Cardenas spoke of being taken by 3 human-like alien entities dressed in tightly fitted bluish-white one-piece suits. He was taken to a beach someplace totally unfamiliar to him where he saw deep blue water, a narrow sand beach and reddish-brown to reddish-purple rocks rising steeply away from the beach sand. While the spacecraft hovered at ground level the aliens worked some kind of a lock on a rock. One of the aliens got out of the small craft they were in and pointed a "flashlight" kind of instrument at a large rock abutement. The rock parted and revealed a tunnel or a large cavern. More of the same or similar craft came out and they all took off and flew out over the ocean waves. Suddenly they all tilted down and descended into the water and went underneath the surface. He remembered being seated near the "glass" of the windshield, or port and seeing the sea water rush by at great velocity but it didn't seem to be touching the "glass". Cardenas returned to the abduction site several times, and each time he arrived there his expensive gold electronic watch would run very rapidly and gain time. He could audibly hear it whirr inside. For some time after returning, each time he touched it with his right index finger it would speed up and whirr again, and he demonstrated this for his wife, Dr. Sanchez and other friends. He took it to be repaired. At the abduction site he would hear "their" voices in his head and he would be given information. Later he could do this without going to the site. On 21 February 1979, about a month and a half after the first abduction, he was directed to the same site again. By now he was asking if his wife, Iris, could accompany him, and this time he took her along. At around 03:00 a top-shaped UFO arrived and he and his wife were BOTH taken aboard the ship and did not return until nearly 06:00 AM the following morning! This time they were both aboard in full waking consciousness and remained fully aware and alert the whole time. They could both remember the whole experience without hypnotic regression. These UFOnauts were described something like the beings encountered by Herbert Schirmer in Nebraska in 1967. The aliens wore tight-fitted blue-white one-piece suits covering everything except the face. The Cardenases observed a serpentlike emblem on the right breast of the garment and a buttonlike earphone over the right ear with a small antenna sticking out the top. The main physical difference was the smaller 4-foot size of the beings. They spoke telepathically to the Cardenases, and conversed among themselves in a language that sounded like Arabic. The two male and one female crew members seemed fascinated by Iris Cardenas' painted fingernails and toenails. The aliens suffered from sneezing throughout the experience, and explained that there was something that emanated from human bodies that caused this in close proximity. The control room in the spacecraft was surrounded by one wall of small 3-dimensional TV-like screens showing a great many things. Another wall was covered with illuminated colored buttons of many shades. Mrs. Cardenas said that she pinched herself to be sure she was not dreaming. She also asked one of the aliens if she could touch him and he agreed. The material of his suit felt slick in one direction and rough in another, like tiny fish scales. His body was firm under the material of the suit. "They spoke to me of universal LOVE," Cardenas said, "And I have learned from them that this is what I must do - LOVE and help my fellow man." Cardenas experienced a period of time after the first abduction where he was telepathically influenced to say meaningless words and numbers for 5 minutes each night. He now reports heightened telepathic sensitivity toward others. He once sensed that his father-in-law need aid, and drove automatically to the spot where the man's car had broken down. 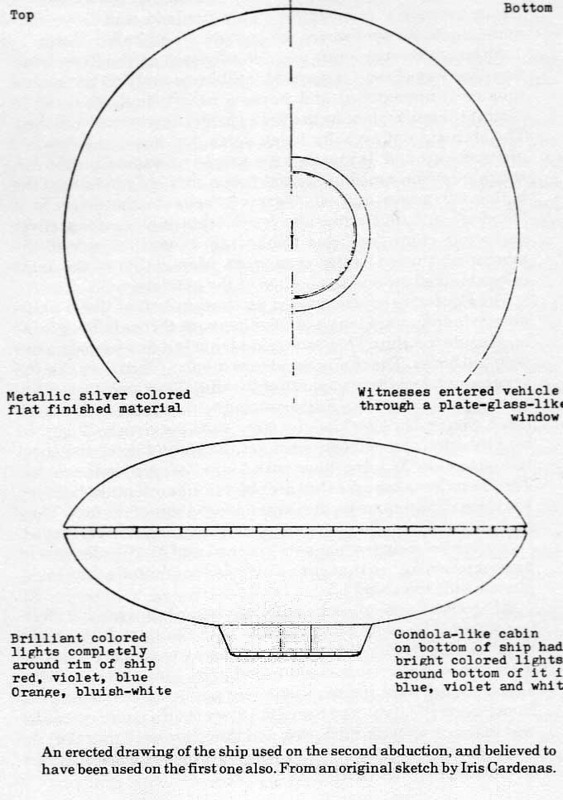 Although no spacecraft was actually seen on the first abduction, one was clearly observed by Filiberto and Iris the second time as it approached and hovered near their parked car in almost the same place as the first when Filiberto was snatched. The ship did not actually touch down, but hovered a few feet above the ground. It was as large as a refrigerated railroad car, roughly mushroom-shaped, and had a smaller gondola on the bottom. It was a dull silver-gray in color in the air until it "landed", and then a row of colored lights of blue, violet, silver and white came "on" and blinked all around the side of the mushroom-shaped larger upper part. More lights of the same colors blinked around the bottom of the gondola. The Cardenas couple walked up to what looked like a plate-glass window, and then suddenly they were through the "glass" and inside the ship. They saw several narrow one-legged chairs with tall backs. The chairs could turn around. Then they saw the very human looking occupants of the ship. They were from 3½ to 4 feet tall (smaller than Filiberto) and were dressed in the tight-fitted silvery bluish-white one-piece suits previously described by Filiberto. The emblem worn on the right side of the chest looked like an "X" lying down with a raised serpent in the center. The aliens have big eyes that are oblique, like orientals, but they were longer and came farther around to the side of the face. They had a normal straight nose and a small mouth that never moved. Iris lighted a cigarette inside the craft and Mr. Cardenas told her not to smoke "so that she would not contaminate the atmosphere inside the ship". When Cardenas, telepathically advised of this second meeting, asked if he could bring his wife to the contact, he was told that "they" considered Iris and him a unity or that she was one with him and therefore could accompany him. Iris asked the aliens if they were the ones who had abducted two little girls from Puerto Rico (she had heard the story from a nurse when she was in the clinic with Filiberto), and they answered that they do not abduct little girls..., which relieved Iris of the fears for her 3-year-old daughter, Barbarita. The alien beings all had an identical arrangement of 5 thin cables that came from the lower waistline up to the neck of the suit and went inside. These cables did not hamper the movement of the beings in any way. Filiberto says the aliens spoke of many things, but he does not want to elaborate on them at this time. Some things are best left to the future, that there is a time for everything. He and his wife were in the ship from about 04:00 to 05:15 AM. When they returned home-about 05:30-Filiberto immediately called Dr. Sanchez-Ocejo and told him of the second contact but that he couldn't say anything until after 10:00 AM. He would call Sanchez back later. At exactly 10:00 AM a large mother-ship with 2 smaller disc-shaped objects flying around it was seen by hundreds of witnesses at Miami International Airport (10 miles from this most recent encounter). Mrs. Julia Gonzales and Mr. Ricardo Sanchez, -airport employees working in the center of the airport runway area, -stated that they observed all 3 objects clearly for several minutes. They also saw passengers who were boarding a flight for departure stop and stare at the unusual spectacle, and saw other airport employees watching the ships in the sky overhead. Gonzales called a local radio station to report the strange phenomenon and was referred to Dr. Sanchez-Ocejo, the same one who investigated the Cardenas case, whom they then called and reported the sighting, almost while it was still going on. When Sanchez hung up the phone from that call, the second call from Filiberto, who was also trying to call him (on his instructions from the aliens to wait until after 10:00- to report the details of the second abduction aboard the spacecraft. Filiberto knew nothing of the airport sighting until Sanchez told him at that time, and then he began to wonder about the strange instructions to wait until after the specific time. When Sanchez interviewed the airport workers from their particular sighting point and ascertained the exact position of the spacecraft, said to be about 11:00 o'clock from magnetic north and high in that direction, he could easily see that that position is DIRECTLY over the place where the Cardenas couple was taken aboard 5 hours earlier! "TV panels" in the control room aboard the spacecraft. He received full sight and sound, as well as other sensory sensations such as heat and cold and smells. The scenes are just as real to him as waking reality experience except that they take place completely withing the "frame" of the scene, like a very sophisticated picture frame suspended freely in the air. His scenes of future events are shown to him in this way. He was told that the only reason he is being shown future events is to demonstrate, in time, the reality of his contacts, so that people will believe him and will accept the "message" on universal LOVE which he has been given. When I joined Dr. Sanchez-Ocejo in his investigation of this case, I was particularly interested in four special aspects of this phenomenon which I had found prominent in another very secret investigation I had been carrying on in that part of the world for some years. The secrecy was necessitated by the position of the contactee in his society and the harm that could come to him if it got out. Nothing was ever released on this case and no part of it was ever transmitted by mail. 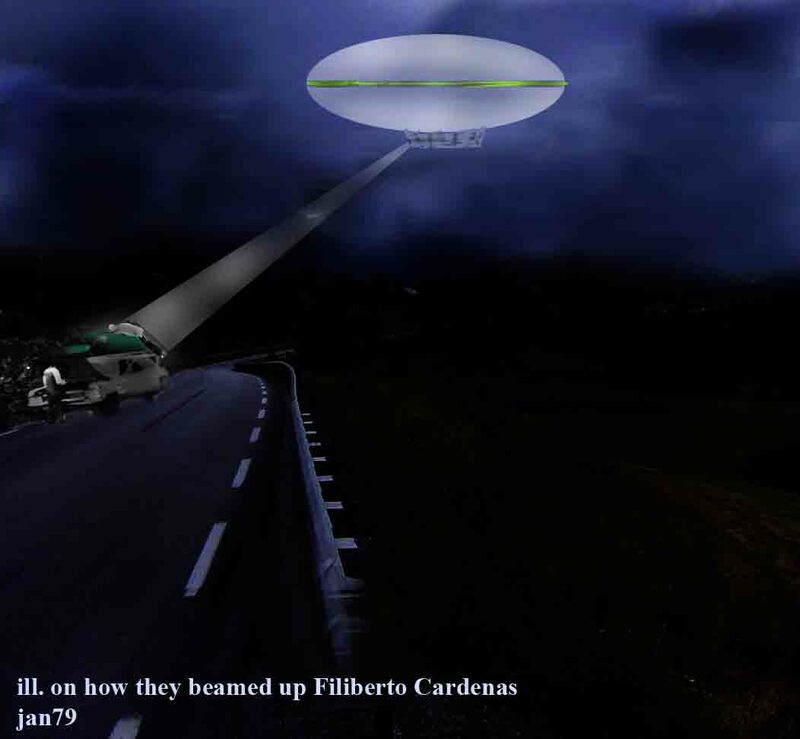 There was little likely-hood that the contactee in Hialeah could have known anything about the contactee in Puerto Rico, and I knew that the man in Puerto Rico had never heard of Filiberto Cardenas. 1. Material devices implanted in the bodies of the contactees by the extraterrestrial beings. 2. 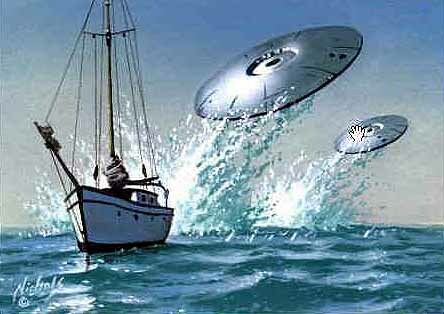 The contactees were taken to deep underwater bases by the extraterrestrial beings in both cases. 3. In both cases the witness was shown a sequence of dire events in store for Earth in our near future, and this was done with picture panoramas projected in the air by some mechanical means. 4. Both contacts have been going on for a long time and are still going on! In both cases the time for release of this information to the world is NOW. I have inserted the summary report of the Puerto Rican case in the back of this book as an appendix. There are still other similar cases that mutually support these two cases also. They will be detailed in future releases. Here then are the complete details of the sensational UFO abduction of Filiberto Cardenas as revealed by the very able investigation of Dr. Sanchez-Ocejo and his special investigation team. It is a pity that more such investigations are not undertaken and published for those who seek to know. A very pertinent point of interest; when I called the local newspapers about this case when I first found out about it, some three to four weeks after the first abduction, I was told that they considered the case suspect and not worth wasting any time on. Another paper said that it was very suspicious and they had ceased following it. A third said some nutty organization had gotten hold of the witness and was trying to exploit it. This piqued my personal interest because this was almost exactly what happened in the Bill Herrmann abduction case in Charleston, South Carolina, which ultimately turned out to have a vast amount of supporting evidence in it that was completely overlooked in the cursory interviews conducted by the media there. We will have more of these and we encourage those new witnesses to come forward with their information as soon as possible.